Apple iPod Hi-Fi is a speaker system that specifically designed for iPod as a accessories for iPod. 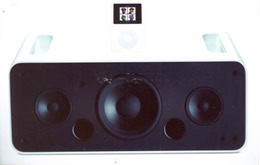 Apple iPod Hi-Fi has two mid-range speakers with a single large center woofer. The speaker system has a built-in universal dock for iPod MP3 players for seamless iPod integration. Beside, a dual-mode auxiliary input is available in the back, allowing playback from either an analog or digital optical source such as older iPod devices. Once you place your iPod on the Universal Dock, your iPod will be automatically charged. For added convenience, you can remote control iPod Hi-Fi with Apple Remote.